This is truly one of the most fun days your water-loving dog can ever have!! 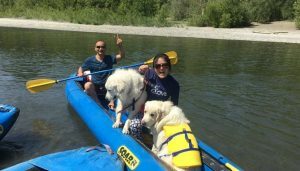 Since 2003, thousands of dogs have joined their owners for a day on the Russian River. SOAR canoes are so stable that even the biggest dogs can’t tip them over. Our full-day trip is guaranteed to tire even the most energetic dogs! For most dogs, climbing aboard a raft or other boat is a new experience. Some dogs are more reluctant than others. 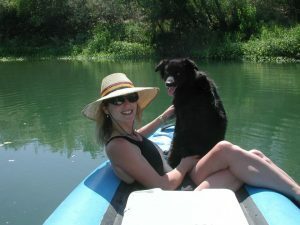 Our staff will assist you in getting your dog into the SOAR canoe. Once in the raft, some dogs get comfortable quickly, others take a little more time. Our staff will assist you and give you some tips. We will ask you to keep your dog in the raft for the first 10 minutes of the trip. After that, your dog will be free to swim and run as much as you will allow your dog. Some dogs swim and romp in the water a lot. Some dogs jump in and out of the SOAR raft. And, of course, there are some dogs that are happy to hang out in the SOAR all day, and don’t go in the water. Active dogs will be tired at the end of the day, and owners must take care that their dogs do not get over-tired. 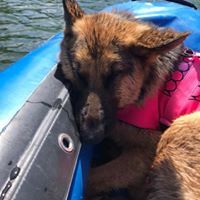 A doggie life jacket will keep a tired dog from getting tired because they provide greater buoyancy. Check out our FAQs or email us here.